All Service Management improvements require change, and one of the most important aspects of the change will be the change in your culture. Affecting people’s behaviors and changing the way they work must be achieved, and taking the time to address these is a crucial part of the criteria for success. Consultants and change leaders will often say that this is an area which can be overlooked and is a very common reason for the improvement to fade over time. 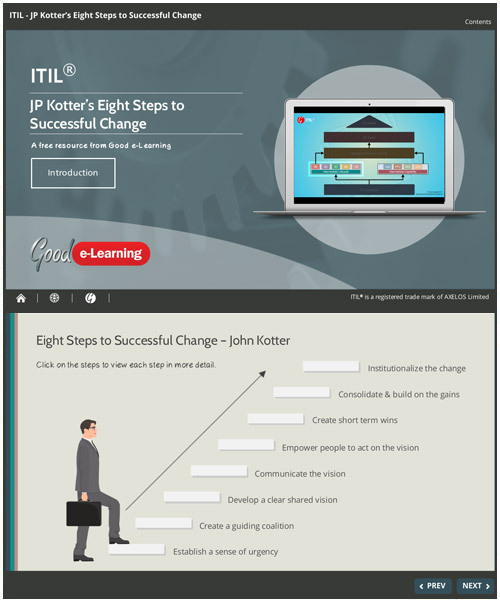 J.P.Kotter’s approach provides guidance for successful management of change, in eight simple, but vital steps. In this interactive guide, we briefly explore each of the steps. Register now to gain instant access to this free ITIL interactive guide and you’ll also gain instant access to our entire library of 450+ free Business and IT learning resources!